Let me preface this with the fact that I’m tired, lazy, and don’t feel like thinking. It’s been a while since I’ve mentioned the ECA, and with the revamping of their site and forums, I figured it’d be good to bring them up once again. So… what is the ECA? To find out what they do, how it started, how to help the cause, etc… Check them out here. Many people are familiar with the format of VBulletin for forums. Even we used them when we were affiliated with GamerNation. This was the previous format for the ECA’s forums. However, the days of that are gone, and they now use Drupal. Why? Well, VBulletin gets to be kind of… let’s just say it was lacking. And riddled with spambots. Needless to say, it was ready for a change. The forums can be found at http://forums.theeca.com/, in which you are welcome to discuss … well, whatever you like, really. Give them a look over, see if it’s a community you would like to engage in. If for some reason you don’t want to email us about stuff, you can leave comments for FFoP in the thread dedicated to Fist Full of Potions: http://forums.theeca.com/node/1013496. Also, if you do happen to find issues regarding the forum (I’ve found several), bear with it. As we had technical issues when revamping this site, they too are finding stuff as it has been live for 24 hours or so. Yes, this is blatant advertising. No, we aren’t getting paid for this. And no, we aren’t selling out. I just felt like telling you about the organization as it can help you with your rights as a “gamer.” In regards to crossovers though, there is a potential person we will be working with that I know through the ECA forums. So look forward to that potential new feature. And check this out… it’s a girl. And then Fist Full of Potions broke from traffic overload. 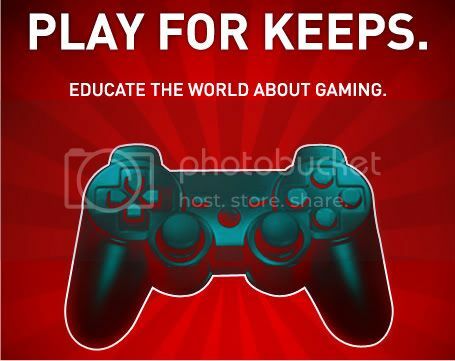 Help us to spread the word about gaming rights by sharing this article on Twitter, or show everyone that you like to be recognized as a person with rights by sharing it on Facebook or Digg or something else, as it helps our site grow. Paying for advertising? Why do that, when you can just follow Jason on Twitter, as well as Fist Full of Potions. If I like you enough, I’m bound to advertise for you. Besides, you wouldn’t want to miss out on awesome updates, would you?